China and India are two of the globe’s most touchy countries when it comes to how their borders are depicted on unofficial maps — in fact, in both countries it is illegal to publish maps where the borders deviate from official “guidance”. This makes the border between India and China quite interesting, especially as large chunks of it are disputed. There is a pleasing symmetry to these disputes: In the west, Aksai Chin is claimed by India but administered by China. To the east, most of Arunachal Pradesh is claimed by China but administered by India. These are huge territories, so you might think there is plenty of room for a negotiated compromise — and you’d be right; just this Friday China and India sat down for yet another round of talks — their thirteenth, in fact. Differences are “narrowing”, according to Reuters. In the past few days, Ogle Earth began receiving a surge of Google Search-referred visits from Indian IP addresses to older posts about Arunachal Pradesh, mostly on variations of searches for “Arunachal Pradesh Google”. Google had previously made an error regarding that region’s disputed border in Google Earth, but had fixed it quickly. Has Google now messed up again, at a particularly sensitive moment in time? ”This is shocking. How could Google change the names of places of a sovereign country without the country’s knowledge?” fumed Congress’s West Arunachal MP Takam Sanjoy. 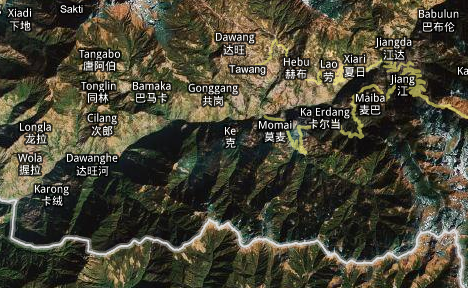 Earlier this week, as part of a routine update to Google Earth, we published new data for the Arunachal Pradesh region that changed the depiction of certain place names in the product. The change was a result of a mistake in our processing of new map data. We are in the process of reverting the data to its previous state, and expect the change to be visible in the product shortly. We would like to clarify that this issue did not impact our depiction of international borders. Someone identifying themselves as an employee of Perfect Relations, India’s self-described largest PR firm, even posted the above statement “on behalf” of Google in the comments section of one of the Ogle Earth posts currently receiving all that Google Search traffic. This seems to be a new strategy, aimed at quickly quenching any budding outrage in the (Indian) blogosphere, by taking the conversation to the blogs themselves. Now it is just a matter of waiting until the names are corrected. But will that end the outrage? 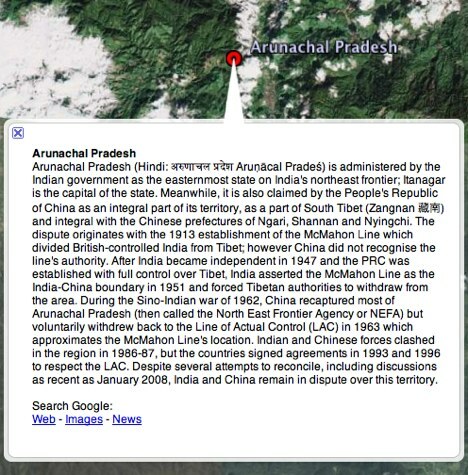 The problem is that when those Indian bloggers and journalists went looking on Google Maps, they also noticed that both the Indian and Chinese claim lines for Arunachal Pradesh are drawn in dotted lines. Neither is given the prominence of a national border, and Google does not play favorites, just as it doesn’t with Aksai Chin, where borders are also drawn in dotted lines. 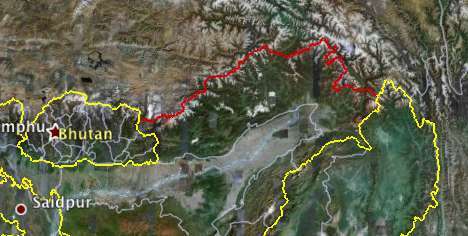 Additionally, “lines of control”, such as the one between India and Pakistan in Kashmir, are in orange. I approve, because I am for more information, not less. Even if you don’t agree with the validity of a certain claim line or de facto control line, you should at least want to know where that line is. Maps that don’t depict such information for political reasons do their users a great disservice. One final question: How might an error like this have happened? Google in fact maintains two sets of Google Maps databases: One for the proper internet, and one for users in China. 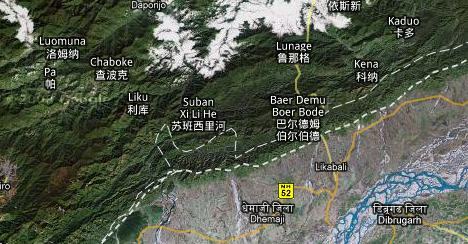 This latter map does depict Arunachal Pradesh as being integral to China, and with identical Chinese names as the one that accidentally populated the global Google Maps. (For example, Tawang on ditu.google.cn vs Tawang on maps.google.com). I always wondered what those red lines were .. Thank you for that complete answer ! china is bullying corporates to modify India map.poor India is targetted by the cancerous countries neighbouring it except nepal and bhutan.Bharat Mata Ki Jai! Thank you for the info. I appreciate the load of information posted here. I love Google, it’s just simply good. – Thanks ! Indian Bloggers should take this matter seriously and urge Govt of India to react in a proper way otherwise use media’s help in giving a hard whip to politicians in power and do something for good.Every Indian who loves this country should feel enraged and react and put an end to this drama played by politicians since independence. Be hard on them and teach them a lesson. It is socking and very disturbing for Indians as china is claiming our whole state and our government have also start giving some reaction till date. This is good at Google have admitted the mistakes and i am sure the map will be edited by Google map team within near future. Ok, this may come a little bit late, but the Gulf of Mexico? Part of the Atlantic Ocean. A gulf it’s not a body of water, but a indentation of sea water on land. It denotates shape, just as a cape is the inverse. So, the name Atlantic Ocean is correctly used. India has border disputes with most of its neighbors, such as Pakistan and Nepal. Just because the British drew border-lines for India without consent from bordering countries and India signs it does not mean it is fact. Perhaps at that time the British wanted to exploit further or felt sorry for being masters of Indians. How much land does china want?Seriously,if chinese claim based on some Chinese kingdoms ruleover a certain region means its chinese,then whole of south asia should be Indias as indian kingdoms ruled much of them for a considerableamount of time.If ur not aggressive,u will be thrown out of ur own house!Its high time Indians Be aggressive in these matters!! What about European place names for the lands of the Indigenous Peoples?